After a bakeless winter where the closest team KL got to a sniff of pastry came in the form of the monthly Greggs run, the ovens were fired up, the aprons dusted down and the Bake Off resurrected ready for Spring. With many still reeling from the sugar overdose that the last Bake Off brought and the office diabetics balancing out their medication once more, a savoury theme was the name of the game. This year we operated a strict ‘bin check’ policy alongside a request for mid-bake photography as evidence of legitimate participation. Some might say that our attention to the Bake Off has gone too far, but with Betty Crocker making a shock last minute entry to last year’s event, here at KL, we have learnt that you can never be too sure. First to fire up the oven was Yvie, weighing in with a classic that wouldn’t be out of place at your Nan’s 80th birthday party. 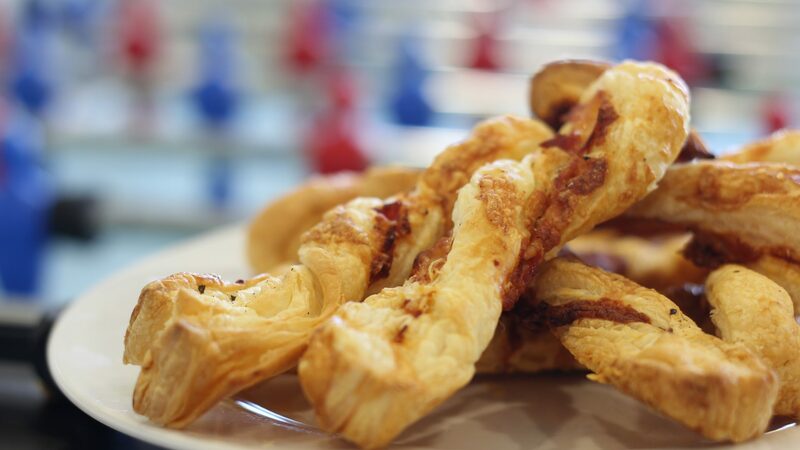 Fully anticipated to be served alongside cheese & pineapple on a stick and a prawn cocktail, this whopping pile of cheese straws pleased the palates of all those who indulged on a rainy Monday morning. And what they lacked in an accompanying dip, they more than made up for in flawless texture and flavour, squashing any room for criticism. Perfectly formed, you could see the love and attention that had gone into twisting up these cheesey bundles, however, questions were raised and detective work undertaken to help determine Yvie’s movements that morning in relation to the opening hours of Lidl, whose bakery churns out very similar looking cheese twists by the dozen. A sterling effort from Yvie to kick things off! 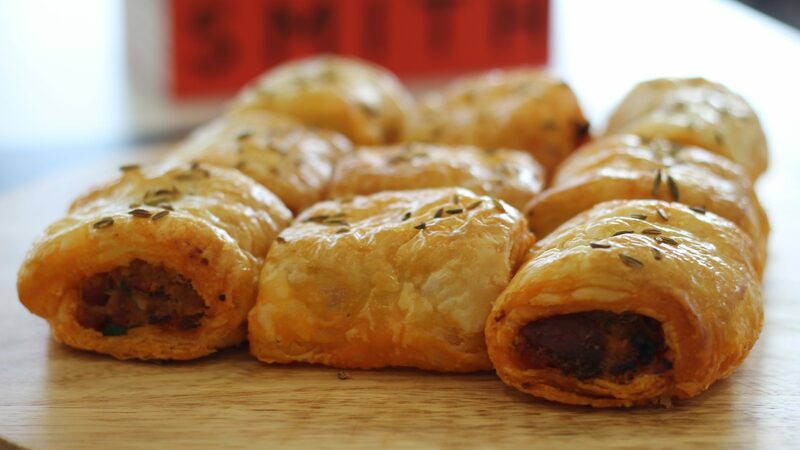 The critics out there might damn the sausage roll as the coward’s way out. A simple creation formed of flaky pastry and blended pig smoothie, crisped up in the oven – you might ask, where’s the ambition? “Who do you think I am, honestly?” replied Elliott when asked to confirm the source of his pastry – an incriminatory revelation from the man who lives off chicken goujons and Frubes. Sufficient put downs complete, Elliott’s sausage rolls were an office triumph and a proper hunk of ‘man cooking’ that ensured the easily impressed amongst us were in awe of his culinary skills, intrigued as to what other masterpieces could possibly leave his kitchen. With his ratio of pig to pastry perfect and not a single fleck of burnt pastry in sight, onlookers were left wondering whether or not the sneaky addition of chorizo and the mystery herb he lightly sprinkled on top as a clear diversion from the truth could help him walk away with the trophy? Hailing from the north of England and regularly filling the office with the aromas of such gastronomical splendours as pot noodles and beans on toast, Ian G’s love affair with fatty, baked goods is a longstanding one that would surely serve him well in the competition. Yet, in an unexpected turn of events, there wasn’t an ounce of coronary-inducing pastry in sight when G brought his bake to the table. Turning to his more refined side, his pesto-infused, tomato laden baked breads were nothing short of culinary perfection, washing away all preconceptions of a bland, Gregg’s-inspired bake. Whilst some asked for the recipe and others sneaked in for seconds, the harsher critics amongst us – bound to the rules dictated by the official Great British Bake Off – had questions. Would Mary Berry as much as even glimpse at these buns, so very unequal in size? Could she ignore the uneven bake that led to charred corners and blackened tomatoes? Mary – if you’re reading, please let us know. Next up was the edible result of what was clearly a desperate attempt to over-achieve and please each and every person in the office that all went horribly wrong. Some would commend our next entrant for waking up at the unearthly hour of 6am to bake a trio of pizzas for her colleagues, but much like the soggy, undercooked base, it was clear that Kerri had spread herself too thin. Despite grave concerns as to the extent that the homemade dough was actually cooked, probable food poisoning didn’t seem to deter the hungry KL tribe, who, perhaps unwisely and through greed, attacked the offerings like ravenous animals. A masterpiece to the eye and a delight to the nose, the toppings went some way to salvaging things, but we’re not sure how Kerri’s survived on earth to date, having presented a string of overcooked/undercooked goods at every turn since beginning at KL. Not even Pizza-to-Go would have her as an apprentice. 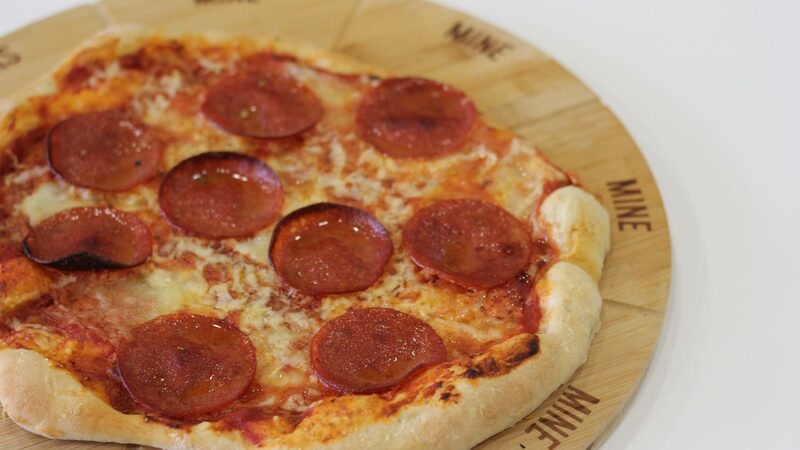 As the newest addition to team KL, Kate was looking to make a good first impression and an edible imprint on the stomachs of her colleagues through utilising her diverse culinary talents. 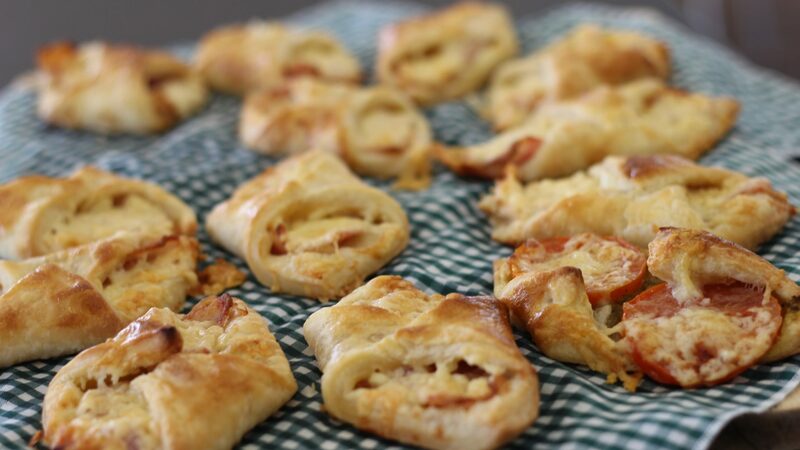 We’re still waiting for her to do so, but what she delivered for the KL Savoury Bake Off can definitely be described as more than edible and a solid classic – the almighty bacon and cheese twist. 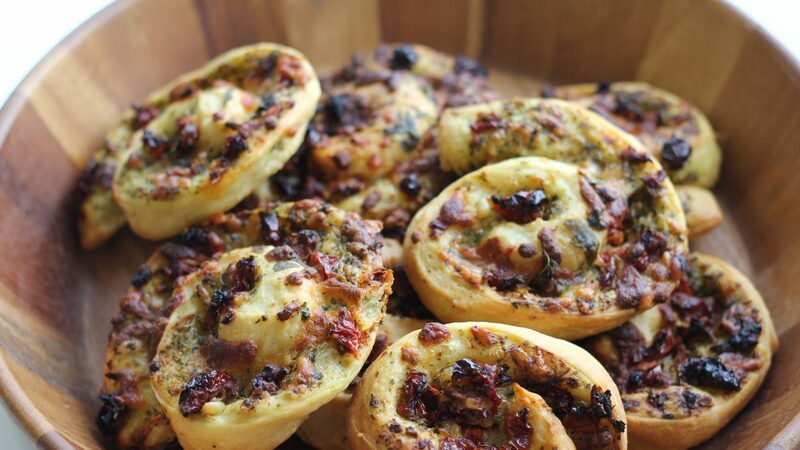 Crispy bacon wrapped in buttery pastry was always going to be a breakfast time hit and it more than looked the part, but the addition of oozy cheese was what rescued Kate from Bake Off mediocracy. As the only person to provide an alternative for the non pig-lovers within the team – although some would consider it a dirty ploy to win their critical vote – her bravery must be applauded for entering the ring with such Bake Off heavyweights so soon into her KL career. Bravo! Renowned as the office’s very own nimble-fingered Mary Berry, as ever, expectations were high ahead of Paul’s much anticipated bake. Some even camped outside the KL studio overnight in an attempt to be first in line for whatever he was to unveil, braving the chill and fruity aromas of the nearby farms. Come 9am, the clouds parted and the studio doors opened to a chaotic mass of Paul groupies only to be greeted with a monumental departure from his usually elaborate and decedent baked contributions. A shockwave surged through the office as he revealed a handful of anaemic, flaky tarts. Nothing spectacular on the surface, it was left to the tried and tested combination of goats cheese, chilli and caramelised onion to turn things around. 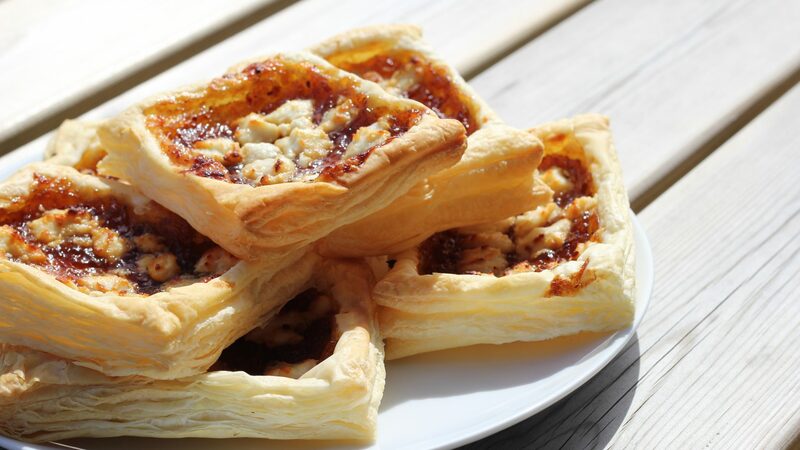 Tasting far better than they looked at first glance, Paul’s tarts were tasty morsels, worthy of the kind of satirical clap you give to kids at sports day for simply ‘taking part’. That, my friends, brings the Spring Savoury Bake Off to a well-rounded close, despite not all (including Rob’s mum) choosing to participate. This year, the votes were compiled in an official looking box on teeny, tiny slips of paper, reduced in size from last time after the onslaught of long-form abuse received by Ian Linassi and his lemon & courgette cake (you can reduce the size of our paper, but you’ll never silence us! ), but not counted. In a noble act of kindness, this year’s Bake Off trophy was awarded to Paul, despite his meagre efforts to impress, to celebrate his culinary contributions to the KL studio over the years! A fitting honour to the man now departing for a distant land where the butter is on tap.